Good news if you like hybrids but want them to be fun: Volvo is going to start offering Polestar Engineered editions of their T8 plug-in hybrid S60 and V60 models. This not only brings the performance-oriented Volvo models enthusiasts have wanted to market, but it also proves that there is still light in this world. Specifically in Gothenburg. What Do You Want To Know About The 2019 Volvo V60? The Polestar Engineered versions of the S60, V60 and XC60 will come with upgraded brakes, suspension and power figures. That’s right, not only are these the makings of a full-fledged performance upgrade, but they’re coming to the freaking wagon. Regarding power, note that the Polestar Engineered models are receiving uprated versions of the T8 twin-engine setup rather than all-new powerplants. Still, the setup produces 415 horsepower and an eyebrow raising 494 lb-ft of torque for the turbocharged, supercharged and hybrid 2.0-liter four-cylinder. For reference, that’s nearly 100 more lb-ft of torque than a base M3 despite being down about 30 HP. In a Volvo. Of course, you can already get an XC60 with 400 hp and 472 lb-ft that sprints to 60 in about five seconds. But now, Volvo’s backing up those ambitions with six-piston Brembo brakes and adjustable shock absorbers shared with the Polestar One. 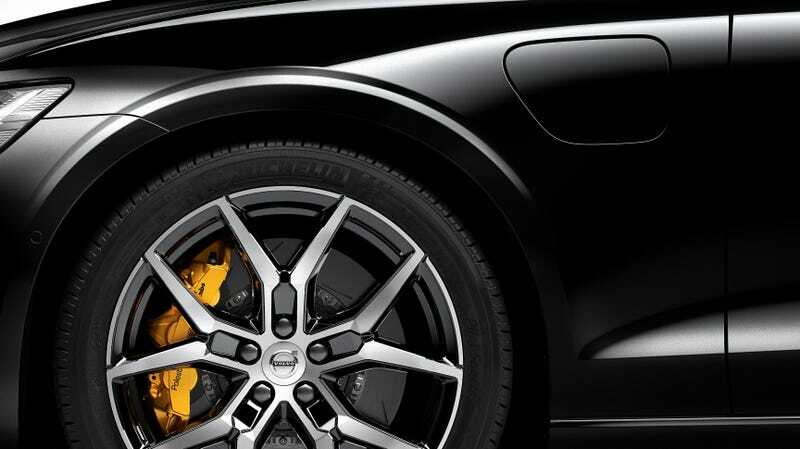 You’ll know the Polestar Engineered models by the gold brake calipers. These should make it to dealers early next year for traditional buyers and Care By Volvo subscribers, whenever that gets sorted.